Learn new skills, meet new friends, and explore different experiences – all in your own community. Carewest volunteers contribute in a meaningful and significant way to the day-to-day lives of many people in our organization, and our programs continues to grow with new and exciting opportunities for volunteers interested in working in our rehabilitation and recovery programs or with long-term care residents. Please see the drop-down lists below for information on our different Carewest sites and some of the volunteer opportunities best suited to your interests, or proximity to work/home. Or click here to link directly to the Propellus website for more detailed information about our volunteer opportunities. Make sure you do a search for “Carewest”. Carewest has numerous volunteer opportunities currently available at our 10 care centres around Calgary. Carewest volunteer opportunities are listed below as well as on the Propellus website (do a search for “Carewest”). Administrative volunteers assist with tasks such as filing, follow-up calls to general inquiries, building tours, room audits, and setting up conference rooms. Other administrative duties may be included. Play an important role in making this activity enjoyable for our Carewest clients and residents. For many residents, bingo is the highlight of the week! Join in the fun and become a Bingo Caller for various afternoon shifts. Volunteers are needed for this weekly afternoon event to assist with equipment and furniture set-up, greeting and portering guests, serving food and beverages and clean-up/take down. Games Assistant volunteers lead our clients and residents in playing games. This may be one to one, or with small groups. There are various games to choose from such as Bridge, Uno, Checkers, card games and more. The Carewest Gift Shops are exciting hubs of activity, offering a variety of unique gift items. They serve as the local convenience shop for the site with books, magazines, greeting cards, snacks, and personal care items. Gift Shop volunteers help the site as the proceeds generated are donated back to the site to support resident and client programs. As a Gift Shop volunteer, you will gain valuable experience in customer service by creating retail displays, cash operations and assisting with stocking the store. The ability to operate a cash register is an asset but training will be offered. There are a variety of day, evening and weekend shifts available. Enjoy playing a musical instrument? Carewest sites are always looking for volunteers with a musical background who can play hymns while our residents sing. Times and day of the week may be flexible and can be discussed with the Site Contact. Palliative care volunteers provide compassion and support to terminally ill clients. The goal of palliative care is to have the best quality of life for the residents and families who are facing serious illnesses and end-of-life issues. Professional appointment volunteers will be required dependent on scheduled appointments. This opportunity would be suitable for someone with a flexible schedule, preferably available during daytime hours during the week. As a professional appointment volunteer you will be a companion to a client which may involve pushing a wheel chair, meeting with care unit staff members prior to departure and obtaining information, paperwork, and a travel card. During the trip, the volunteer will stay with the resident/client in the waiting room only, return the travel card, and relay any information and paper work to care unit. Special Event volunteers to assist at various special events and seasonal parties, as well as with occasional and time-specific projects. This is an ideal opportunity for individuals with very limited or specific time commitments. By becoming a Carewest Visiting Companion volunteer, you will help to provide social contact, companionship and support. Visiting Companion volunteers help clients and residents stay connected to their communities. Activities could include: baking or cooking, playing cards, conversation, walks, watching movies, helping to open and read mail, puzzles, etc. Shifts are very flexible. Volunteering at the Sarcee Hospice is a unique and meaningful experience. Our volunteers provide invaluable support and compassion to people living with a terminal illness. Hospice volunteers must complete the Inter-Agency Palliative Care Volunteer Training program prior to providing bedside support at end of life. This training is provided free of charge and offered twice a year in the spring and fall. Colonel Belcher accommodates 175 residents with long-term care needs, 135 of whom are veterans. This site also has a Day Support Program. The Fanning Centre accommodates 144 long-term care residents who are under 65 years of ages. It is also home to 144 transitional and chronic complex care clients. The site has two Day Support Programs. Carewest Garrison Green accommodates 200 long-term care residents – approximately 90 of which are under the age of 65 with physical disabilities along with 110 seniors – all who require 24-hour health care in a residential setting. George Boyack accommodates 221 long-term care residents and cares for seniors with and without dementia. A rehabilitation and recovery centre that offers short-stay and day programs for adults. 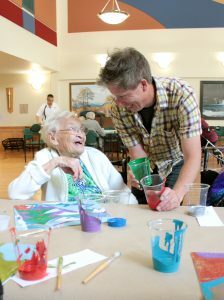 Caring for 50 long-term care residents in a beautiful setting close to Mount Royal University. Home to several Carewest programs including the Hospice at Carewest Sarcee, long-term care and short stay rehabilitation programs. Home to 48 long-term care residents with Alzheimer’s disease and other dementias. Home to 77 long-term care residents with complex behaviours, located at the Holy Cross Centre. This specialized team of trained volunteers provide support to those nearing the end of their lives and others dealing with issues of grief or loss. Thank you for your interest in volunteering with Carewest. Note: You must be 16 or over to volunteer with Carewest. Pain & Palliative and Hospice volunteers must be 18. As required under the Protection for Persons in Care Act (PPCA), Carewest must obtain a current vulnerable sector criminal records check for every new hire and volunteer. Carewest will accept a vulnerable sector criminal records check dated within ninety (90) days prior to commencement of duties. Carewest does not normally hire persons with active criminal records for which a pardon has not been obtained. If you have any questions regarding Carewest’s volunteer opportunities please contact us at 403-943-8171. For a complete listing of all Carewest volunteer opportunities, please visit Propellus (formerly Volunteer Calgary). Carewest is always looking at new and innovative ways to engage with Calgary corporations. We have seen first-hand how valuable the relationship between our clients and corporate volunteers can be. We have been fortunate enough to work with companies that donate their time and energy to assist with special events, spring and fall clean-up, visiting, donations, etc. Whether you have a department of five or 50 employees, we can work together to find mutually beneficial activities. Corporate involvement can be a one-time event or on-going. Carewest actively promotes the full participation of volunteers with disabilities within the social environment at our centres, however, due to our residents’ and clients’ needs, we have minimal volunteer opportunities available for people with developmental disabilities. Volunteers are required to have the ability to assist with hands-on support and guidance to residents and clients. The completion of a Police Security Clearance is required for all new volunteers 18 years and older.